Yesterday, the Galaxy Note 8 was updated to a newer software version that made no changes to the Android security patch date but mentioned improved security in the changelog, leading us to believe the update may have been released to bring fixes for the Meltdown and Spectre exploits that have sent everyone in a frenzy since they were discovered. Now, the Galaxy A8+ (2018) is also getting a new software update with the January 2018 patch, and it may just include patches for the aforementioned exploits. 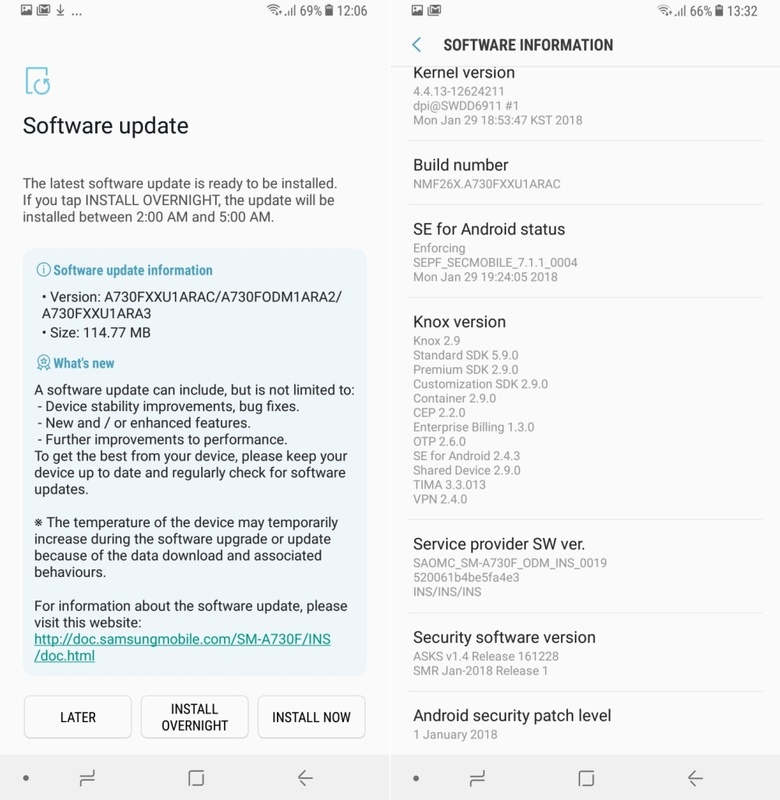 This is the second update for the Galaxy A8+ and is being rolled out in India, which was among the initial countries where the A8+ received its first update and the January patch. In fact, the January patch hasn’t been released for the A8+ in most other markets, making this a solid show of support from Samsung India for a device that’s been on sale for less than two weeks. At 114 MB, the new update is small compared to the usual OTAs Samsung sends out these days. The firmware version is A730FXXU1ARAC, and you should be able to grab the update by tapping the Download updates manually button in the Settings » Software update menu. most of device already not showing version number. In Poland they fixed it with latest update for S7 Edge with January security patch. 8.0 for Note 8 comes in the next 32 hours.